This weekend, the Providence Players close John Guare’s wacky and beautifully fashioned dramatic farce which illuminates the American dream and obsession with celebrity. Zoo attendant Artie Shaughnessy is a failed songwriter with visions of fame and glory. He copes with an overly medicated wife, an impatient mistress, an AWOL and homicidal son being pursued by military police, and beer-drinking nuns on the day the Pope visits New York City. His girlfriend convinces Artie to call his old school buddy Billy Einhorn, a famous film director from Los Angeles, to finagle a job writing music for Billy’s movies in a desperate attempt to find stardom, only to have the plan blow up. 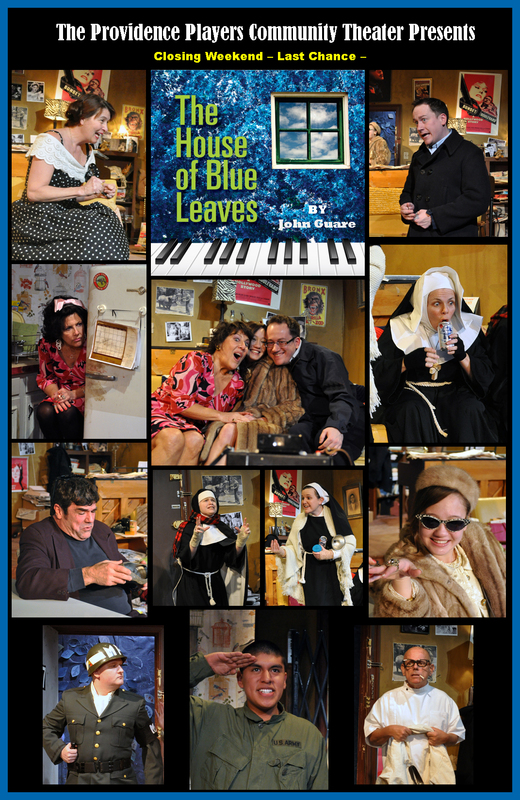 Set in 1965 in Queens NY, The House of Blue Leaves is a unique blend of farce, dark comedy and drama. The New York Times called this multiple Tony award recognized play and winner of the Obie and Drama Critics’ awards for Best American Play, “Enchanting, zany and original”. This production contains some mature themes and a little strong language.